Wow! That's what they'll say when this explosion of color arrives at the front door. They'll love the flowers, the clear glass vase - and you for having such exciting taste. A win-win for everybody! The vibrant bouquet includes pink hydrangea, peach and hot pink roses, orange Asiatic lilies, purple stock, hot pink Matsumoto asters, peach statice, magenta Sweet William and hot pink spray roses accented with fresh greenery. 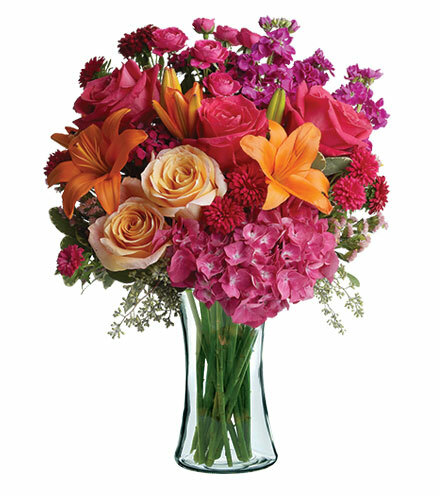 The flowers are delivered in a contemporary clear glass bunch vase.